There are nearly forty authors in this tribute book to our beloved daughter. In Amanda’s loving care, their ideas have blossomed into a collection of thoughts and inspirations to reaffirm that life is precious. Thank you. Katy was born in January 1975 at Leighton Hospital in Cheshire at 9:30 pm. She was only 36 years old when she died but in that time Katy did more things and achieved more than many people manage to do, in a great many more years - she was a bright burning star of hope and compassion born from her own suffering and experience. In 1979 the family moved to Castle Donington and shortly afterwards Katy went to school in Loughborough. She always had a vivid imagination and played a game with her sister Beth, and friends Lucy and Marsha. They were super heroes, who controlled colours. Katy always chose blue because it gave her control of the sky and water. Purple came later. Katy and Beth, along with friends David and Christine, were members of Trident Swimming club in Long Eaton – during early morning training they mastered all the strokes and enjoyed swimming. Katy loved junior school. She used to bring home the animals and birds for the weekend. Caruso, the budgie, we could manage but Boris the tarantula spider was more of a challenge!! Strange, that in later life Katy did not like house spiders but she would sit with Boris on her hand and let him crawl up onto her head! “It’s OK, Mum“she would say, “He’s had his dinner.” Another childhood hobby was horse-riding and she wanted to keep animals in our garden. Once, she suggested getting a goat but she had to make do with a rabbit, called Hyzenthlay [ from’ Watership Down’] Flopsy for short! Hyzenthlay was ‘the lifesaver” in the film. Interesting! Later we had two dogs her beloved Bob and of course Poppy who slept on her bed, ate her dinner when she wasn’t looking and drank her coffee!! Also at this time, Katy learned how to play the piano, trumpet and flute and we used to do that old-fashioned thing around the piano at Christmas. What a lovely memory! Simon and Katy also used to play tricks and on one occasion filled up an old purse with her pet rabbit’s droppings and watched from a nearby hiding place as an excited passer by furtively picked it up and walked on, only to fling it away in disgust a few paces later. We all laughed more at their antics than at anything on TV!! She had an amazing sense of humour but I think a lot of you know that!! During the teen years, Clare Grundy reminded me of the pool parties and sleepovers at the family house in Castle Donington. During one of the parties, the police were called by the neighbours because of the noise. (We were all in bed). Katy passed an advanced driver test, after tuition from Leicestershire police. It struck us as funny that the police chose to train the 6th form girls rather than the boys! Katy was a real stunner with her long blonde locks and long, long legs but short, short skirts!! Afterwards, Katy kept a completely clean driving licence - so it did work! Emma Bell became one of her closest friends at school, during an unhappy time when they were both bullied, very cruelly and although we thought the problem was sorted at the time, we realised that future events proved that this was not so. Katy loved to travel and amongst other trips, managed to visit the USA and Canada, Russia, Italy, Greece and France. She also loved the theatre, particularly musicals like Les Miserable and Miss Saigon but also Shakespeare. Just recently, she arranged a trip for us all to see ‘Anthony and Cleopatra’ in Stratford. Once, we even saw’ Phantom of the Opera’ in Boston! Snow held a fascination for Katy. It started with standing on a red plastic sledge in the garden with Beth and going down the steepest bit of our garden, standing up. She then had an alpine wooden sledge to use locally on Hemington hill and Katy went so fast, she hit the hedge at the bottom and broke her finger. A ski trip with Loughborough High school opened up a sport which Katy really enjoyed and she subsequently skied all over France, Italy, Switzerland, USA and Canada. Whistler was her favourite resort, although Zermatt was a close second. While in Zermatt, one of her heroes, Robbie Williams, was also there so she took her father to most of the bars trying to find him!! Mentioning Robbie, leads us to the music in Katy’s life. It was, we know, a major help to her when she felt unable to concentrate properly. She had a huge CD collection, but besides Robbie, Green Day and Pink were her favourites. She also used films and TV to provide a distraction from the passing of time and had a huge collection of DVDs. Really huge! Family was very important to Katy, as it was the support and love of all those around her, that kept her going at times. We thank all those who helped her so very very much from the Stephen Fry forums because not only were you there for her but you have played an enormous part in aiding our grieving processes. Christmas was always a family time, when she liked to indulge in extravagant presents, and to make cocktails - we particularly remember the strength of her Strawberry Daiquiri Cocktails, which went well with roast parsnips and bread sauce!! One year, Sue could hardly stand to stir the gravy, such was the strength of her drink!! It was lovely!! Also, Katy and Beth would argue over who had the most bread sauce every year, so Sue decided one year to make them their own bowlful and peace then reigned. She was so proud when she became Auntie Katy in 2009 and she doted on her nephew Mikey. She loved reading him stories and playing cheeky peekaboo games. She laughed so much at a family meal when he managed to get more of his chocolate pudding on his face than in his mouth. “There is no better friend than a sister and there is no better sister than you” Tom also told us of his admiration for Katy and he would spend ages talking to her, trying to sort through her ideas. Tom and Katy were very close. Katy longed for marriage and babies of her own but knew that because of her medication, this was not possible. She did find love in her short life and she had a brief engagement whilst in Oxford but this did not last. Academically, Katy did very well with 9 GSCEs all A’s except one, 4 A levels, a 2.1 degree from the University of Nottingham in Biochemistry with Nutrition. During this time she had a few health problems that were the visible start to her illness. Katy once told Paul she actually didn’t work very hard at all -it just came easily to her. That was until the project for her finals because she really wanted to do the DPhil at Oxford. Katy managed to do a project that she invented with the support of the head of the medical school. After Nottingham University, Katy embarked on the DPhil at Oxford in Clinical Medicine to study the effects of a low- fat diet on Diabetes. She presented her preliminary findings at conferences in New Orleans and Vienna but sadly then became very ill and so she was prevented from completing it. It was also the first time she was properly diagnosed as having bipolar disorder. We remember the friendship she struck up with Clare Baker, who used to support her through the worst times in Oxford. That friendship is one that has endured to the present day –Clare said “Jack Lemmon said that ‘Death ends a life, not a relationship’. And so Katy is still all these things to me: a true friend, a protective daughter, a loving sister, a doting auntie. She was kind, generous, loving, forgiving, open, and funny. She had the soul of a poet, the courage of a lioness and carried a burden most of us would have dropped long ago”. In early 2003, Katy came back home to Castle Donington and gradually became stable albeit having to continue to take very powerful drugs, and all with the unstinting support of her GP Dr McGrath. We cannot thank Carol enough for the wonderful care and love she gave to our darling girl. Katy decided the most useful thing she could do was to help others by publishing a book about her own experience, to both educate and provide encouragement to others. It was difficult at first but once written she struggled to find a publisher. After many fruitless attempts, but never giving up she was finally published by Chipmunka in August 2008. Her first book was called “Dark Clouds Gather” an autobiographical account written to inspire others. She subsequently had a further 4 books published “Too good for this world” - stories of 15 other people with mood disorders “Reflective Reflections” - eating disorder guide “Screaming in Silence” - a pro survivor pro recovery guide In 2010 she had her first fictional novel published called – “The Gentle Murders”. Outside of writing, Beth got Katy involved in a group in the village doing pantomimes and singing productions called Blue Balloon. We can honestly say Katy had more fun being involved in this than anything else we can think of, and it definitely helped her recovery at the time, so thank you to all the other members of this wonderful gang of people. There are many charities for mental illness but until 2007 there wasn’t one dedicated to Bipolar disorder- in the UK alone there are estimated to be 2.5 million sufferers –they can reflect a wide range of symptoms. Alan Ogilvie, who had been Katy’s doctor in Oxford, asked her to help with the set-up of the new charity called “Equilibrium –The Bipolar foundation” whose mission amongst others was to carry out further research into its causes and research new more effective treatments. In particular, he asked her to run the Testimony project to document cases from every continent to highlight just how widespread Bipolar Disorder is. Over a period of time Katy used her ingenuity to do this and you can see how successful she was by visiting the website. One of the main ambassadors of the charity is Stephen Fry. He produced a BBC program “The Secret Life of the Manic Depressive”. In it Stephen highlighted that he himself suffered from Bipolar disorder and over two programs probably did more than anyone had done before to raise awareness round the world of the illness. As a result, Katy became involved in Stephen’s website answering questions and trying to help people who were having problems. Katy eventually became a moderator on the site meaning she could help influence the policy and direction it took. Today, the forum on the Stephen Fry website is alive with testimonials to all the good she managed to achieve. Here are some words from Toby from Texas. “Katy was indeed a fighter, and just as we've all been impacted by her loss, she too was devastated by the loss of those she loved to this illness. That and her desire to have a quality of life motivated her into battle. Katy came to the Stephen Fry forum bound and determined to make a difference, which she did from the word go, and for many. She fostered a spirit of kindness, understanding and support here, which we are now also bound to follow and continue. For her it was also important to emphasize that everyone was welcome here and to bullet point that Mental illness affects everyone in some way, either directly or indirectly, and that family members and friends can play a huge role in helping to combat the stigmas and promote awareness. She also commented frequently on the importance of understanding that a concerted effort is a huge boon in the day to day for sufferers of all mental illness. As most of you know this portion of the forum was born out Stephen Fry's own struggles with this illness. Mr Fry expressed his sadness at the news of Katy-Sara's passing and was deeply touched by "how we are all remembering her and honouring her memory", and he passed on his best wishes and thoughts to those grieving. Katy leaves her family and friends devastated at their loss but proud in the knowledge that in spite of her suffering she did more than most to help other people and was very successful and popular among those kindred spirits. Thank you to all of you who have made this tribute book possible…it means so much to us. Remember fight on, for - She did not hold her head in shame. Please help us fight the stigma of mental illness and continue Katy’s work to convince people to love themselves as well as others. 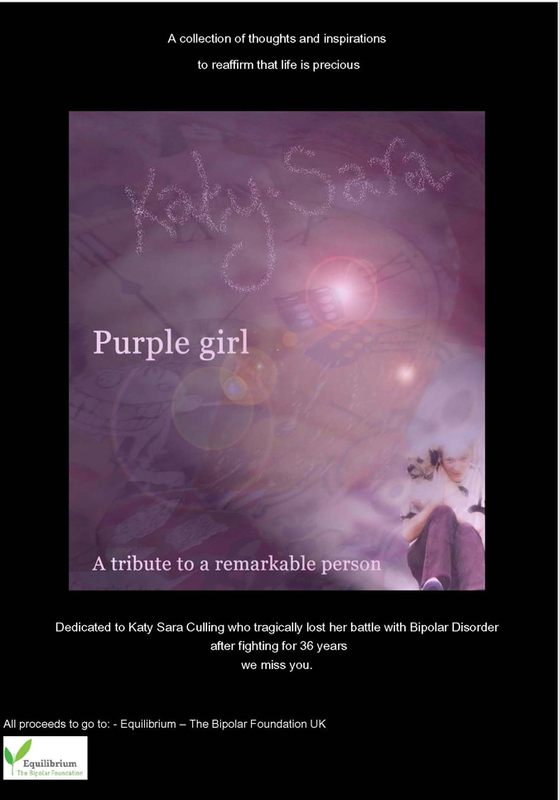 Katy tried so hard to beat this terrible illness but eventually we have had to “let go” for her sake so that she could quieten her frantic mind. We are so proud of our darling daughter.